The U.S. Coast Guard is issuing a Worldwide Notice to all mariners who use GPS equipment that on April 6-7, 2019, a parameter in the GPS system will “roll over” to zero, which may affect older GPS equipment, or equipment that has not received firmware or software updates recently. Read the Notice. For Alaska specific information, click here. Civil GPS users are encouraged to report disruptions or anomalies to the U.S. Coast Guard Navigation Center, or via phone at 703.313.5900, 24 hours a day. The House Fish and Game Finance Subcommittee met on March 19, 20, and 21. The meeting on March 19 (Watch Meeting Here) looked at budget action items. The meeting March 20 (Watch Meeting Here) dealt with closeout and budget amendments. And lastly, the meeting on March 21 (Watch Meeting Here), dealt with the budget narrative report closeout. The Governor submitted 29 Fish and Game budget action items. The House Finance Subcommittee accepted 10 of them. The House Finance Subcommittee rejected 19 of them. An amendment removing the following wordage: At the discretion of the Office of Management and Budget, funding may be transferred between all appropriations in the Department. Intent language stating that it is the intent of the legislature that the Department of Fish and Game retain the State Subsistence Research Division Director PCN (11-0400) and the Habitat Division Director (11-6001) and that these PCNs and associated funding not be used outside of those allocations. On March 19, the House Fisheries Committee hosted Hatchery Presentations by Regional Aquaculture Associations as well as the Mcdowell Group who gave a presentation on the Economic Impacts of Alaska’s Salmon Hatcheries. Watch the Meeting Here. On March 21, the House Fisheries Committee heard HB 41 – Shellfish Enhance. Projects; Hatcheries. Public Testimony was held and the bill was moved out of committee and sent to House Finance. Watch the Meeting Here. SB 51 – Natl. Res. Water Nomination/Designation was heard in Senate Resources on March 20 where public testimony was held. Watch the Meeting Here. The bill is scheduled again to be heard on March 27 in Senate Resources. SB 63 – Fish Tax: Repeal Muni Refunds/Rev. Share had its first hearing on March 21. Public Testimony was held. Watch the Meeting Here. The bill did not move out of committee. Legislative Meetings of interest for this weekend and the week of March 25 – March 29, 2019. Presentation: Pebble Project Status & Updates on Permitting & Environmental Impact Statement by Tom Collier (CEO), John Shively (Chairman), James Fueg (VP of Permitting). Testimony (Invitation Only). Meeting Link. SB 51 – Natl. Res. Water Nomination/Designation (Senate Resources) Currently in Senate Resources with a hearing scheduled for March 27. 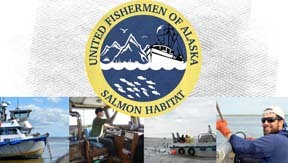 SB 61 – Commercial Fishermen’s Fund: Vessel Owner Claims (Stevens – UFA Supports) Currently in Senate Finance with a hearing scheduled for March 27. SB 90 – Cook Inlet: New Admin Area; Permit Buyback (Micciche) Currently in Senate Resources with a hearing scheduled for March 29. HB 35 – Conflict of Interest: Board Fisheries/Game (Stutes – UFA Supports) Currently in House Resources with hearing scheduled for March 27 & 29. HB 41 – Shellfish Enhance. Projects; Hatcheries (Ortiz – UFA Supports) Currently in House Finance with no scheduled hearings at this time.